Saint John was born on the 4th of June 1896 on the country estate of his parents, descendants of nobility, Boris Ivanovich and Glaphira Mikhailovna Maximovitch in the little town of Adamovka in the Province of Kharkov. At Baptism he received his name in honour of Saint Michael the Archangel. His paternal ancestors were of Serbian extraction. One of his ancestors, Saint John, Metropolitan of Tobolsk, was an ascetic of holy life, a missionary, and a spiritual writer. Saint John of Tobolsk lived in the first half of the 18th century and was glorified in 1916. His glorification was the last celebrated during the reign of the Tsar Martyr Nicholas. Saint John was an obedient child; his sister recalls that it was very easy for his parents to raise him. Ruminating about his future during his youth, he could not make a definite decision as to a career, being unsure as to whether he should dedicate himself to military or civil service He only knew that his future life would be guided by an insuperable desire to stand up for the Truth, which was nurtured in him by his parents. He was inspired by the examples of those people who live their lives for the Truth. He commenced his education at the Poltava Military Academy which, Vladyka himself would later say, “was dedicated to one of the glorious pages of the history of Russia.” He was an exemplary student, but he disliked two subjects; gymnastics and dancing. He was well liked at the academy, but nevertheless felt he should choose a different path. This idea was especially furthered by contact with the well known religious instructor at the academy, Archpriest Sergei Chetverikov, author of books about Saint Paisius Velichkovsky and the Holy Optina Elders, and with the rector of the local seminary, Archimandrite Varlaam. The day of Michael Maximovitch’s completion of the military academy coincided with that of Archbishop Anthony’s (Khrapovitsky) investiture to the catherdra of the See of Kharkov. This renowned hierarch and theologian was the main advocate of the restoration of the patriarchate in Russia, subsequently the Metropolitan of Kiev and Galich, and finally the First Hierarch of the Russian Orthodox Church Abroad. Throughout his life this Archpastor inspired the church-oriented academic youth in all matters spiritual thanks to his principal attribute – his sincere love for them. Having heard about young Michael Maximovitch, of whom many spoke in church circles, Archbishop Anthony desired to meet him. It was in Kharkov that Archbishop Anthony became Saint John’s spiritual guide. This relationship continued throughout Archbishop Anthony’s whole life. In Kharkov Michael entered Law School, which he completed in 1918, and served for a while in the Kharkov court during the days when the Ukraine was ruled by the Cossack leader, (Hetman) Skoropatsky. But the heart of the future hierarch was far from this world. When not studying, he spent all of his free time at the university reading spiritual literature, especially favouring the lives of saints. “While studying the worldly sciences,” said the Saint during his election to the episcopacy, “I delved all the more into the study of the Science of sciences, into the study of the spiritual life.” Visiting the monastery in which Archbishop Anthony lived, Michael had the opportunity to pray at the tomb of an ascetic of the first half of the 18th century, Archbishop Leletius Leontievish, a deeply revered but not yet glorified righteous one. The soul of the young saint was pierced by a thirst to obtain the true goal and path of life in Christ. 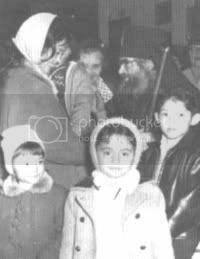 A great impression was made upon Michael by Bishop Varnava (subsequently the Patriarch of Serbia) during his visit to Kharkov. The young Serbian bishop, who was warmly greeted by Archbishop Anthony, related to him the suffering of the Serbian people under the Turkish Yoke. This was in January 1917, before the revolution, when the Serbs, who were battling against Germany, Austria and Turkey, had almost no territory which was free of enemy occupation. Through the inspiration of Archbishop Anthony the response of the Russian people in support of the Serbs was unanimous. In this example, Michael recognised the universal significance of the Church and the duty of a bishop to respond to the needs of all Orthodox people. In turn, Bishop Varnava, upon becoming Patriarch, was particularly hospitable and helpful to the hierarchy of the Russian Orthodox Church Abroad. 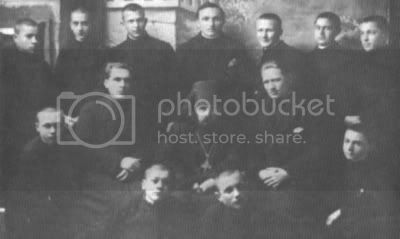 The Russian Revolution forced the Maximovitch family to flee their homeland and evacuate to Yugoslavia, where Michael was able to begin his theological studies at the University of Saint Sava which he completed in 1925. During his last year, Michael was tonsured a reader in Belgrade by Metropolitan Anthony, who also, in 1926, tonsured him a monk in the Milkovo Monastery giving him the name John in honour of his distant relative, the recently glorified Saint John of Tobolsk. Shortly thereafter he was ordained hierodeacon. On the Feast of the Entry of the Most Holy Theotokos into the Temple, the young monastic became a hieromonk. During these years he was a religious instructor at the Serbian State High School, and in 1929 he became an instructor in the Serbian Seminary of the Holy Apostle John the Theologian in the city of Bitol – part of the Ochrid Diocese. In Bitol, Saint John won the love of his students and it was here that his spiritual struggles became known to those around him. Saint John prayed continually, served the Divine Liturgy daily, or attended Liturgy and partook of Christ’s Holy Mysteries, fasted strictly and usually ate once a day late in the evening. With fatherly love the Saint instilled in the seminary students high spiritual ideals. They were the first to discover his great ascetic podvig noticing that the Saint never lay down to sleep, and when he did doze off, it was only from utter exhaustion and often during a prostration in the corner under the icons. Bishop Nicholas (Velimirovich) valued and loved the young hieromonk John. Upon leaving the seminary once, he turned to a small group of seminarians and said, “Children, listen to Fr. John. He is an Angel of God in the image of a man.” The seminarians themselves were convinced that Saint John truly lived an angelic life. His patience and humility were similar to the patience and humility of the great ascetics and desert dwellers. He relived the events of the Holy Gospel as if they were taking place before his eyes. He always knew the chapter where to find an event and, when needed, could always quote a given verse. He knew the character and details of every student, so that at any moment he could assess what a student knew or did not know. Saint John had a special gift of God: an unusually good memory. Consequently, such assessments of his students could be made without referring to any previous records or notes. Mutual love bound Saint John and the seminarians together. For them he was the incarnation of all of the Christian virtues. They did not see any shortcomings in him, not even in his speech (Saint John had a slight stammer). There was no problem, personal or social, which he could not solve quickly. There was not a question for which he could not find an answer. His answer was always concise, clear, complete and exhaustive because he was truly an educated man. His education, his “wisdom,” was based on the most stable foundation, “the Fear of God.” The Saint prayed zealously for his seminarians. Each night he would make his rounds, checking everyone; adjusting one’s pillow, another’s blanket. Upon leaving the room he blessed the slumberer with the sign of the cross. During the first week of Great Lent, Saint John ate nothing more than one prosphora a day, the same during Passion Week. When Great Saturday came his body was completely exhausted. But on the Day of the Holy Resurrection of the Lord he was revived, his strength returned. At Paschal Matins he triumphantly exclaimed, “Christ is Risen!” as if Christ resurrected specifically on that holy night. His face shone. The Paschal joy which the Saint radiated was imparted to everyone in the church. Anyone who was ever in church with Saint John on Pascha experienced this. In 1934 the Synod of Bishops of the Russian Orthodox Church Abroad decided to elevate Saint John to the rank of bishop and assign him to Shanghai as vicar bishop of the Diocese of China. As for Saint John himself, nothing could have been further from his mind, which is obvious from an account of one of his acquaintances from Yugoslavia. Once, when meeting him on the tramway she asked him what had brought him to Belgrade. He answered that he came to Belgrade because he had mistakenly received a notice in place of another hieromonk John, who was to be made a bishop. When she saw him again the next day, he told her that the mistake was worse than he had expected, because it turned out that they had decided to consecrate him a bishop. When he objected, pointing out his stammer, he was told that the Prophet Moses had the same difficulty. The consecration took place on the 28th of May 1934. Saint John was the last bishop to be consecrated by Metropolitan Anthony. The young bishop arrived in Shanghai from Serbia on November 21, 1935, the Feast of the Entry of the Most Holy Theotokos into the Temple. Many people had gathered on the dock to meet their new archpastor who wholeheartedly undertook his responsibilities and soon became an established figure in the city of Shanghai. The completion of a large cathedral as well as the resolution of an existing jurisdictional conflict awaited him. 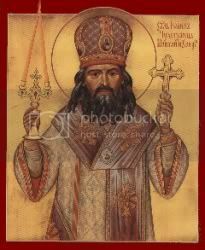 Saint John quickly quelled this conflict and, in time, established relations with the Serbs, Greeks, and Ukrainians in his diocese. The Saint completed the construction of the huge cathedral in honour of the Icon of the Mother of God “Surety of Sinners” and a three story house with a bell tower. He dedicated special attention to the spiritual education of the children. He personally taught the Law of God to the upper classes of the Commercial Institute and always attended the examinations for the religious courses in all of the schools of Shanghai. He was the inspirer and leader in the construction of churches, a hospital, an asylum for the mentally ill, an orphanage, a home for the elderly, a community dining hall – in short, all of the social undertakings of Russian Shanghai. The Saint was one with his flock. He participated directly in the work of virtually all emigrant organisations. However, while participating actively in such an array of worldly affairs, he was foreign to the world. From the first day of his arrival in Shanghai, the Saint, as before, served Divine Liturgy daily. No matter where he was, he was always present at Divine Services. Once, as a result of his continual standing, the Saint’s foot was severely swollen and a group of physicians, fearing gangrene, prescribed immediate hospitalisation. The Saint refused. The Russian doctors informed the Parish Council, that they could not take any responsibility for the health and even the life of the patient. The members of the Parish Council, after extensive requests and even threats to forcefully hospitalise him, compelled the Saint to agree, and he was sent to the hospital. That evening however, he left the hospital on his own and at six o’clock was serving the All-Night Vigil as usual. He performed all of the daily services completely and unabridged, so that, at Compline, five or more canons would be read, so as to honour all of the Saints. The Saint did not allow unnecessary conversations in the sanctuary and personally made sure that the servers behaved as they should, compiling for them a rule of conduct, to which he strictly, yet affectionately, constrained adherence. After Liturgy Saint John remained in the sanctuary two or three hours, concerning which he once commented, “How difficult it is to tear oneself from prayer and return to worldly affairs.” At night he remained vigilant as opposed to sleeping. He never went “visiting” specifically, instead, he would appear unexpectedly to those in need, in any weather and at the most unusual hours. Daily he visited the sick with the Holy Gifts. Often he was seen, at some late hour, in inclement weather, walking on the streets of Shanghai with his bishop’s staff in hand and his rassa blowing in the wind. When asked where he was headed in such weather, the Saint would reply, “Not too far away, I need to visit so-and-so,” and when they escorted him to that place the “not too far away” was frequently two or three kilometres. “While concerning oneself with the salvation of men’s souls,” said the Saint, “one needs to remember that people also have bodily needs which clamorously declare their presence. 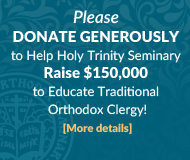 One cannot preach the Gospel without manifesting love in one’s deeds.” One of Saint John’s manifestations of such love was the founding of the Orphanage of Saint Tikhon of Zadonsk for orphans and children of needy parents. He called together some women and, with their help, began with eight little children and organised an orphanage which gave refuge to many hundreds of children in its fifteen-year existence in Shanghai. Vladyka himself gathered sickly and hungry children from the streets and from the dark alleys of Shanghai. Once he brought in a little girl to the orphanage, having “bought” her from a chinaman for a bottle of vodka. His flock was not mistaken in giving such a great assessment of the work of its pastor. People truly felt in him a readiness “to lay down his life” for the flock. During the Japanese occupation, when two presidents of the Russian Emigration Committee were killed in succession and fear gripped the Russian colony, Saint John, despite the undoubted danger to himself, declared himself the temporary head of the Russian colony. After a long delay caused by the war, an order arrived from the Synod of Bishops elevating Bishop John to Archbishop with direct submission to the Synod. The Chinese National Government and the city authorities acknowledged Archbishop John as the sole head of the Russian Orthodox Church in China. The miracle-working power and clairvoyance of Saint John were well known in Shanghai. Once, during Bright Week, Saint John came to the Jewish hospital to visit the Orthodox patients there. Passing through one ward, he stopped in front of a screen, concealing the bed upon which an elderly Jewish woman lay dying. Her family members were awaiting her death nearby. The Saint raised a cross above the screen and loudly proclaimed: “Christ is Risen!” upon which the dying woman regained consciousness and asked for water. The Saint approached the nurse and said, “The patient wants to drink.” The medical staff were stunned by the change which had taken place in one who only moments earlier was dying. Soon the woman recovered and was discharged from the hospital. Such incidents were numerous. It so happened that Saint John was urgently called to administer Holy Communion to a dying man in the hospital. Having taken the Holy Gifts, the Saint headed there with another clergyman. When they arrived they saw a young man, about 20 years of age, playing on a harmonica. He had already recovered and was to leave the hospital shortly. The Saint called him over saying, “I want to give you Holy Communion right now.” The young man immediately came up to him, confessed, and received Holy Communion. The amazed clergyman asked Saint John why he did not go to the one dying, but detained himself with an obviously healthy young man. The Saint answered simply, “He will die tonight, but the other, who is seriously ill, will live yet many years.” That is precisely what came to pass. The Lord manifested similar miracles in Europe and America through His Saint. At the end of the 1940’s as the communists came to power, Russians in China were forced to flee again, most via the Philippine Islands. In 1949 almost 5000 refugees from China were located in a camp of the International Refugee Organisation on the island of Tubabao. They lived there in tents under the most primitive circumstances. All of the children of the orphanage were brought there, as were the elderly and infirm. They lived under the continual threat of fierce hurricanes, since the island is located in the path of seasonal typhoons which pass through that part of the Pacific Ocean. During the twenty-seven-month existence of the Russian encampment, only once was the island threatened by a typhoon, which, however, changed its course and passed around the island. Every night Saint John would walk around the entire camp blessing it with the sign of the Cross on all four sides. 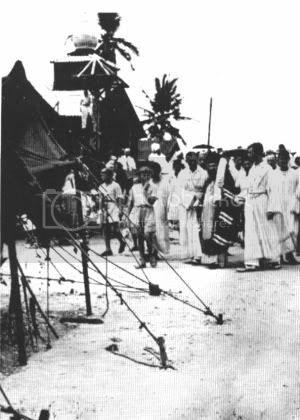 Later when the people had departed for various countries and the camp had been almost completely evacuated, a fierce typhoon swept over the camp and leveled it to the ground. More than once Saint John had to appear before representatives of civil authority to intercede for the needs of the Russian refugees. It was recommended to Saint John that he personally petition in Washington D.C., so that those in the camp could come to America. He flew to Washington and, contrary to all human obstacles, succeeded in having immigration laws changed and the exodus of his flock was realised. While in Europe, Saint John collected information on a number of ancient Saints venerated in the West, but forgotten in the East. Upon his recommendation their veneration was restored and their names recorded in the Church calendar. Saint John’s spirituality, his knowledge of languages, and, most of all, his example, attracted many French, Dutch and other Europeans to Orthodoxy. Such was the missionary significance of his stay in Europe. In the Fall of 1962 Saint John arrived in his last Diocesan See, and again, just as many years ago in his first Diocese, on the Feast of the Entry of the Most Holy Theotokos into the Temple. At first he came to assist the aging and infirm elder, Archbishop Tikhon and after his repose (March 17, 1963 o.s.) Saint John became ruling Archbishop of Western America and San Francisco. Again the Saint arrived to find an unfinished church, dedicated to the memory of the Mother of God, and once again, as in China, the Church was torn by discord. Saint John’s first priority was to resume and complete the construction of the new Diocesan Cathedral of the Most Holy Theotokos “Joy of All Who Sorrow”, which had been entirely halted due to a lack of funds and sharp disputes as to the solution of the financial dilemma paralysing the church community. The Lord mercifully helped His Saint in this, who was suffering greatly as a result of this discord, yet continued both by prayer and by tirelessly overseeing the construction, to inspire everyone to sacrifice and work. Saint John had to endure much at that time, even the necessity of appearing in an American civil court. The last years of his life were full of the bitterness of slander and persecution. Sometimes Saint John aroused envy, unfavourable criticisms, or bewilderment in people, when he dealt with them strictly adhering to church rules. At that time, someone asked who was responsible for the division in the Church. The Saint answered simply: “the devil”. 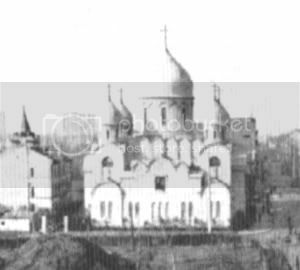 In 1964, construction of the largest church of the Russian Church Abroad in America, adorned with five golden domes, was essentially complete. The elevation of the magnificent crosses, the grandeur of which is visible when sailing in the San Francisco Bay, was proceeded by a solemn procession (over a mile) with masses of people participating. The procession was almost cancelled due to heavy rains, but the Saint, without any hesitation, led the procession with hymns into the drenched streets of the City. As the procession began the rain stopped. The crosses were blessed in front of the new cathedral and when the main cross was elevated, the sun broke through and a dove lighted upon the brightly shining symbol of Christ. This visible triumph of the elevating of Orthodox crosses, symbols of Christ’s victory, shining on the hills of a contemporary Babylon where satanism has been openly professed, was the crowning victory of the life of the Saint on earth. 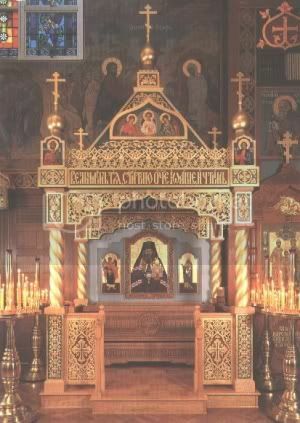 While accompanying the Wonder-Working Kursk-Root Icon of the Most Holy Theotokos to Seattle, Saint John, having served Divine Liturgy there in the Saint Nicholas Catherdral, remained in the altar for three hours. It was the 19th of June (o.s.) 1966. Then having visited some of his spiritual children who lived near the cathedral with the Wonder-working Icon, he proceeded to a room in the church house where he was staying. Suddenly, those accompanying the Archpastor heard the sound of someone falling to the floor. When they ran up the stairs they discovered him lying on the floor and already departing this world. They sat him up in an armchair before the Wonder-working icon and the Saint peacefully reposed in the Lord. At that moment, his extraordinarily difficult struggle of depriving himself of rest and sleep ceased. They laid him on a bed that was in the room, a blessed berth, giving him rest and sleep after 40 years of abstinence. “Sleep now in peace!” cried Archbishop Averky of Syracuse and Holy Trinity Monastery, who zealously loved him. In the conclusion of his homily during the funeral he said: “Sleep now in peace, O our dear, beloved Vladyka. Rest from your righteous works and struggles. Rest in peace until the General Resurrection.” The solemn funeral of Saint John took place on June 24, 1966 (o.s.) in the Cathedral of the Most-Holy Theotokos, the Joy of All Who Sorrow, in the city of San Francisco. The funeral began at 6.00 p.m. and finished after 1.00 am, as a result of the multitude of people, who came to bid farewell to their reposed archpastor. Metropolitan Philaret officiated at the funeral in concelebration with Archbishops Leonty and Averky, Bishops Sava and Nektary and a multitude of clergy. The air of the funeral was strikingly poignant and exaltedly prayerful. None of its participants shall ever forget it. Despite the deep sorrow of the countless admirers of Saint John, a kind of special joy predominated, enveloping all of the faithful. The body of Saint John remained in an open casket in the cathedral for five days and, despite the hot summer weather, was untouched by even the slightest hint of corruption or stiffness. His hands were soft and pliant. And all of this, despite the fact that nothing whatsoever was done to his body at the mortuary. After his blessed repose, just as during his life, Saint John continues to perform various miracles and healings for those who turn to him with faith. People, during difficult moments in their lives, when no earthly power is capable of helping, have beseeched his intercession before the Lord. Letters, as well as prayer lists, have been placed under the miter on the tomb of the Saint and many have received the help for which they had hoped. In the fall of 1993 the Synod of Bishops charged the Archbishop Anthony of Western America and San Francisco, together with a commission comprised of two other archpastors, to examine Saint John’s remains. In the evening of September 28, 1993 (o.s. ), after a pannykhida served in the sepulcher by members of the commission, Archbishop Anthony gave a brief homily, calling all participants of this holy work to be reconciled and himself asking forgiveness of everyone, blessed those present to open the tomb. Having removed the lid of the sarcophagus, the participants withdrew the metal coffin of the Saint and noticed that in many places it had completely rusted through. With the fear of God and with prayer, they opened the coffin. The face of the Saint was covered and everyone immediately turned their attention to his white, incorrupt hands. 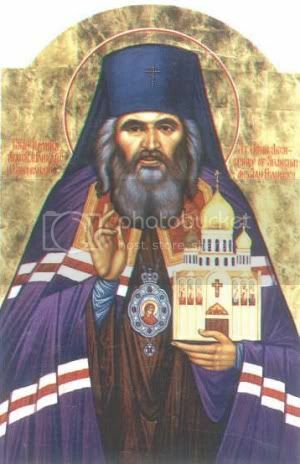 Having prayed, Archbishop Anthony removed the “aer” from the brow of Vladyka and exposed the incorrupt face of the God-glorified Saint. At this moment a kind of supernatural spiritual peace, an extraordinary reverent silence was felt. No one was amazed, no one spoke. All problems seemed to vanish, such was the Grace-filled experience of standing beside the Saint’s relics. At the next meeting of the Synod of Bishops, Archbishop Anthony reported that the honourable relics of Saint John were examined by the Synodal Commission comprised of himself, Archbishop Laurus of Syracuse and Holy Trinity, Bishop Kyrill of Seattle and twelve other persons chosen by the diocesan bishop. Having heard Archbishop Anthony’s report and the Report of the Commission for the examination of the relics of Saint John, the Synod of Bishops blessed the continuation of the efforts in preparation of the Glorification of Saint John, which was scheduled for June 19 (o.s. ), the day of his blessed repose. Through the prayers of our holy father John, may the Lord God preserve us from every evil, strengthen our faith, and help us to journey upon the true path to salvation. To our God, Who is wondrous in His Saints, be all glory, honour, and worship, now and ever, and unto the ages of ages. Amen.